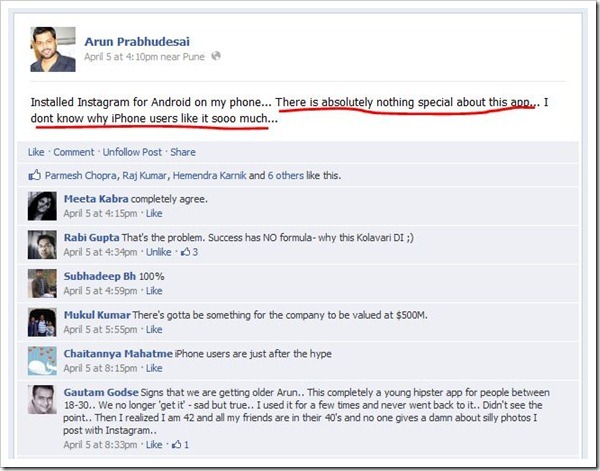 Facebook’s Instagram Acquisition: Don’t think valuation, think synergies! This is what has been happening on my messaging client since last 12 – 14 hours since Instagram acquisition news came out. Friend: Did you hear about Instagram’s 1 Billion Dollar Acquisition by Facebook? So what has Facebook bought for 1 Billion Dollars? – A popular but average product , a dozen employees, no revenue to show ? Yes, that’s what they have bought, along with user base of a few million users (which are already on Facebook). Prima Facie, this deal looks ridiculous and highly over-priced if look at it from valuation perspective alone. However, if you look at Facebook & Instagram together, it looks like a beautiful marriage. The one which has power to make 1 and 1 into 11. Facebook last year reported 3.7 billion turnover with 1 Billion dollars profit. Do you know that not even 1 percent of that revenue was from mobile. And Instagram is all mobile. Facebook Photos is probably the most important feature of Facebook. More photos are uploaded on Facebook than any other site in the world. With Instagram’s popularity growing and use of mobile devices increasing globally, Instagram was a serious threat to the core of Facebook, which it could not afford to ignore. With Instagram being all about photos and mobile, it not only addresses 2 major growth points of Facebook, but also safeguards against any future threats in those areas. Although Mark Zuckerberg in his post has been clear that Instagram will be a separate entity and they will independently take the app & the brand forward – One thing is for sure, Instagram may soon see some core Facebook features added to it. Although Valuation is very high, the synergies are just too great to be ignored. I can say Facebook – Instagram is a great marriage , albeit a real expensive one… What is your take? Interesting viewpoint. Mobile is definitely the clincher. I believe Google and Facebook were played off against each other to achieve this valuation. I just saw a video review of Instagram on Android – underwhelming. This will go in books as a great casestudy in "Marketing". Several hollywood celebrities were promoting Instagram through Twitter for the past year. And by very publicly ignoring the largest mobile platform (Android) till recently and making it "available only on iPhone" they successfully created a huge "latent demand" and buzz. What's next – Google buying Pinterest? I agree with your synergy point but saying there’s nothing special in Instagram makes no sense. What do you expect from an app? Without any photoshop or any software knowledge, Instagram gives artistic look to your photos with just one click…what more do you want? Even professional photographers are using this application.